(This review originally appeared on my short-lived blog Netflix Fiend a couple years ago. With the recent release of all the Superman movies in a fancy Blu-ray box set, I thought I’d run it here now). 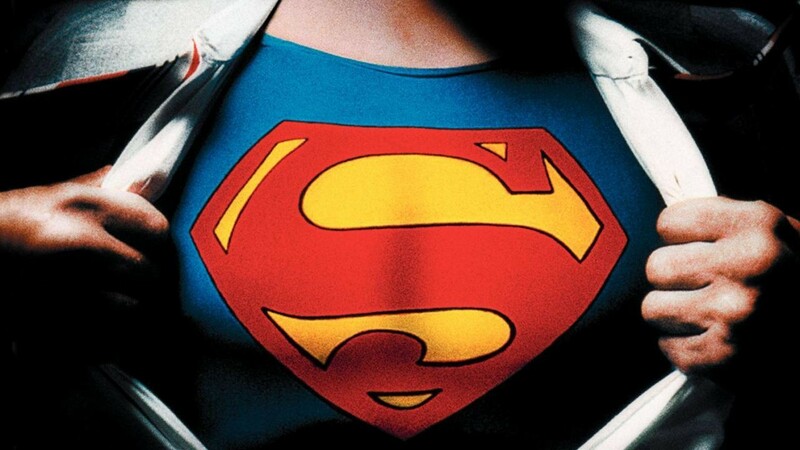 I’m a huge fan of Richard Donner’s Superman: The Movie — I love the mythic feel it has, and along with The Incredible Hulk TV series, in 1978 it was pretty much the only time I’d seen a comic book adaptation treated with respect. I do think it went off the rails a little with the Batman-TV-show-esque interplay between Lex Luthor, Otis and Miss Teschmacher, and that “Otis Theme” makes me wanna kick the coffee table over, although everything else about John Williams’ score is incredibly good (I dare you to tell me you don’t get goosebumps during the opening credits sequence as that big S roars past and the music swells). I’ve never been much of a fan of Richard Lester’s Superman II, however. Even as a doofy 16-year-old, I thought Lester was an odd choice for such a movie, and the flick itself looked cheap and kind of half-assed, particularly in comparison to the first film. I know a lot of people really dug it, largely because of the battle between Superman, General Zod, Non and Ursa in the streets and skies of Metropolis, but I thought the whole sequence seemed a little fruity, what with the slow-moving pointy-toed kicks and whatnot. Overall, I felt like the progress towards respect to the material that had been made with the first film had largely been lost, in favor of goofy jokes and silly situations. 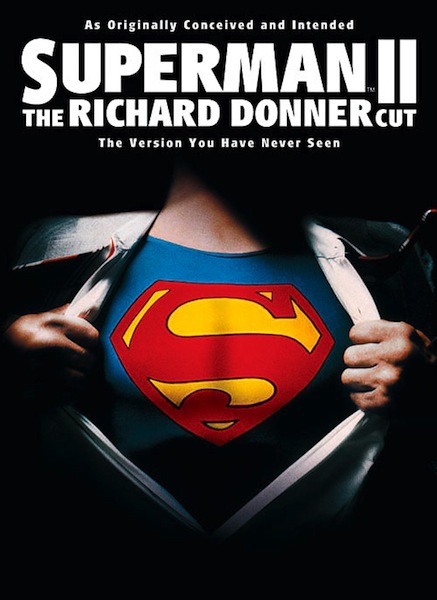 Most people are probably aware that Richard Donner was shooting Superman and Superman II back-to-back, and wound up getting fired from the project before the second film was completed, which led to Lester taking over. While he’s credited for helping create the music video thanks to helming A Hard Day’s Night and Help!, Lester was never a wildly visual director — that said, however, the slapstick set pieces in Lester’s A Funny Thing Happened On The Way To The Forum and the fight scenes in The Three Musketeers/The Four Musketeers are rousing sequences that stand up as some of the best put on film, but it almost seems that Lester’s style was overburdened by the subject matter of Superman II and as a result, sequences that needed some serious visual flair tended to look as if Lester aimed a camera at them and said “go.” It didn’t help that for a movie released the same year as The Empire Strikes Back, Superman II looked as if it had been made ten years prior. Recently, thanks to interest from fans of the Superman series, Warner Brothers allowed Richard Donner to revisit his “lost film” and create Superman II: The Richard Donner Cut. Of course, Donner had to use portions of Lester’s version to put together a complete movie, but the results are really kind of astonishing. Donner and editor Michael Thau recut the Lester scenes, tightening them and removing many of the cornier elements, re-inserted the Marlon Brando sequences that were dropped from the original version of Superman II when the producers didn’t want to pay Brando’s exorbitant fee (his scenes were replaced with less-than-thrilling footage of Susannah York as Lara-El), and added scenes that Donner had shot before being fired. One of the things I never liked about Lester’s version was the way Lois Lane finally outs Clark Kent as Superman — his glasses fall into the fireplace and he snatches them out without getting burned. The new scene (using the term “new” loosely, I suppose) is still not entirely satisfying but pays off with a little more impact. Donner was never able to shoot the sequence during production, however, so screen test footage was used, and it’s interesting to see how much Christopher Reeve inhabited both roles — Clark Kent and Superman — even then. Donner’s cut of the movie significantly improves the overall tone of the flick, bringing it much closer in spirit to the first Superman — which is unfortunate only during some of the scenes involving Lex Luthor, which are still too campy for my taste. The fight between Superman and the Phantom Zone criminals plays much better here, too — the awkward moments are mostly gone, some new stuff has been added, and it feels like much more is at stake than it did originally. The movie is still lacking that great quality of American Mythology that Donner brought to Superman: The Movie, though, and while I’d absolutely say the Donner cut is a far more satisfying movie than the Lester version, more than anything it makes me wish Donner had been able to shoot the movie he envisioned from the start. Definitely worth seeing (and be sure to watch the featurette about putting the new cut together), and while I was never inclined to own Superman II on DVD, I’ll be buying this version.